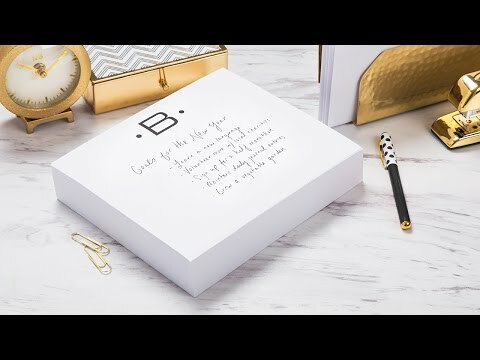 A touch of personalization makes this giftable stationery notepad a go-to for hosts, friends, or anyone who appreciates thick, high quality paper with a classic finish. One notepad moves from jotting down lists to penning letters without missing a beat. The paper is Made in the USA and easily doubles as stationary—just fold it to fit perfectly in a business envelope. Dimensions: 8.5" x 7" x 2"
The initialed notepad stationary's fine, but it would be nice if business envelopes made with the same high-quality paper stock was also available. My wife loved this and is currently burning her way through the pages. I'll have to order another one for her before too long. I love this pad and I have bought some for gifts. I will keep buying these. Great size, perfect for my desk and impressive to clients. Write notes or letters....the paper is heavy and rich! I’ll reorder for sure! When a sheet from a notepad deftly transforms into sophisticated stationery, it’s one sharp-looking and multitasking win-win. The thick notepad blocks from Black Ink pull double duty by letting you move between to-do lists and writing letters. Fold a heavyweight paper page to fit into a standard business envelope, and—voila! It’s now fine stationery. The dense, high-quality notepads are Made in the USA and showcase Founder Patti Black’s signature, classic style. Patti has her own custom stationery boutique that specializes in weddings, so she is the right person to nail the balance between function, quality, and looking fantastic. One of her notepad designs makes a perfect, ready-to-go gift, too—for teachers, hosts, or friends—that will be reached for time and time again.